Sponge Bob has to be one of the most obnoxious shows ever on TV. Having said that, there is no denying its massive impact on pop culture. People LOVE this insanity. Many have grown up with it, and it still around. Spawning a slew of merchandise and even a feature film. This ‘Bye Squid’ design is a Marine dispatching the character called Squidward on the show. Why? Why not. 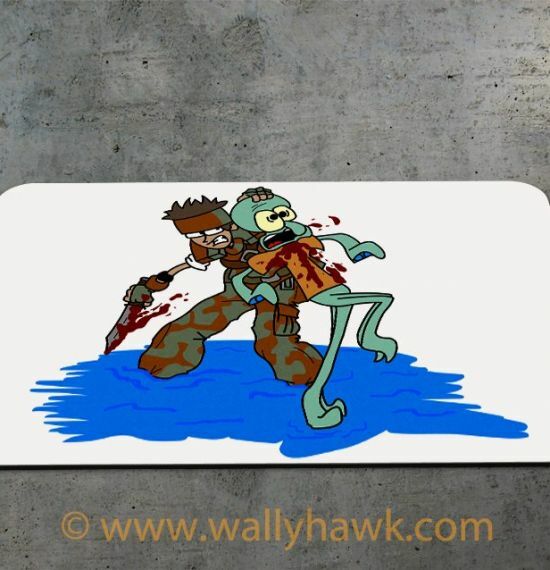 This awesome Spongebob Spoof design was drawn by one of WallyHawk’s oldest friend’s and half the namesake. Mike Virgilio. Be on the lookout of more original designs as well as upcoming comics from Mike! The Bye Squid Button is made of all American high quality metal and mylar. The design is laser printed for sharpness and colorization. There are a variety of backings available to suit your needs.